I once dated a girl who was all about achieving. She had been a top of her class student all the way, and had immense career prospects. She was involved in a number of causes and community groups and was clearly going to change the world. I, on the other hand, was an adequate achiever with modest goals and a slightly different outlook. I wanted to do well at what I did and make a good living, but I didn’t feel the same sense of drive. In fact, sometimes I liked to goof off. I would look at work that needed to be done and the brilliant sun outside, shrug, and reason that while the work would be there tomorrow, this perfect day might not be. She couldn’t agree sadly, and it was one of the reasons we parted ways. One other factor was that sometimes I’m silly. I get on well with children and am completely at home reading my niece stories, with funny voices and all. I’ll get down on the floor and play dolls with her, and while her Cindy doll might make some cynical conversation (that goes right over my nieces head thankfully) I will give myself to it with abandon because it’s fun to do that. I don’t even need children around for it. But some women find that disconcerting. It’s a little juvenile to want to stop in the toy aisle of the department store when you don’t have kids, and even more so to set up the army action figures in the dolls house for a tea party, but here’s a newsflash: a lot of guys actually like being a little juvenile and irresponsible sometimes. Unfortunately, some women will disapprove, and make it known. My message to them is, lighten up! There will always be people who don’t have a crazy and reckless streak, but I think they are the exception, not the norm. Most people I know like to blow off a little steam once in a while and I think it’s vital that for a guy to be considering sharing his life with some, he factors that in. If the woman he is considering marrying can’t accept him being a little crazy every once in a while, then it is going to become a strain. If he has to bottle up his childish instincts because his fiancé will scowl when he dashes through a neighbor’s sprinkler on their evening walk, he is not going to be a very relaxed guy eventually. If any silliness – which lets off steam – is frowned upon, he’ll start to suffer stress because that is what a little childishness combats. Instead I would say cultivate a little frivolity yourself. It doesn’t mean you have to be immature or puerile all the time; just allow yourself to play sometimes. When we laugh we feel good about ourselves and those we are laughing with. It will draw you closer together to be able to have some fun, and you will become a part of the stress relief he probably needs from time to time. If you can initiate it sometimes it will tell him that you are a good person to have around. So pay attention to how your guy plays sometimes. Take note of how his silliness emerges; is it dumb movies, goofing off with friends or being a little mischievous? If he’s into practical jokes, get a feel for what the boundaries are and join him in it – maybe participating in one of his before trying your own. Whatever you do, lighten up and have some fun with your guy, and he will want to experience more things in this world with you. 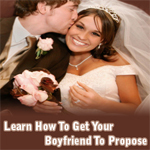 Discover the secrets to make your man to pop the question.